The 13th season of the classic Doctor Who series saw the departure of some major characters. The last regular appearances of Brigadier Alistair Gordon Lethbridge-Stewart (Nicholas Courtney), Mister (nee Sergeant) John Benton (John Levene), and Lieutenant (Doctor) Harry Sullivan (Ian Marter). 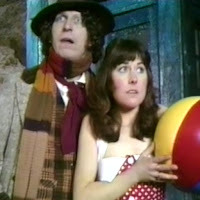 The 6-serial, 26-episode season began with the return of The Doctor, Sarah Jane, and Harry to the present, following up the distress call The Doctor received from the Brigadier at the end of Season 12. The first serial, Terror of the Zygons (4 episodes), introduced -- you guessed it -- the Zygons. In this serial, the Brigadier receives a call from the Prime Minister, whom he addresses as "Madame." At the times the episode was recorded and aired, Harold Wilson of the Labour Party was Prime Minister. He was succeeded by fellow Labour Party MP James Callaghan a year later. When the episode aired, Margaret Thatcher was leader of the Conservative Party, but wouldn't become Prime Minister until four years later. However, since the series was, at the time, set in the near-future, commonly accepted to be five years from the then-present, the writers got this one right. The serial was also Nicholas Courtney's last regular appearance as Brigadier Lethbridge-Stewart. Though there would be two more serials involving UNIT, the Brigadier wouldn't be in either. Courtney was unavailable, so they wrote his character as visiting Geneva. Planet of Evil (4 episodes) was similar to Forbidden Planet in that an invisible creature was killing members of an expedition to a planet. And, kinda like Dr. Jekyll and Mr. Hyde in that a character kept transforming from normal-looking fellow to an ugly, hairy, evil killer. The third serial had an interesting plot. It was called Pyramids of Mars (4 episodes) and dealt with a connection between Egyptian civilization and extraterrestrial aliens. And, if you're familiar with Richard Hoagland's whole pyramids on Mars thing, keep in mind that's from after the Viking landings in July 1976. This serial aired 8-9 months before that. No one had seen images from Mars that kinda looked like pyramids. So that whole face and pyramids on Mars thing? Nobody came up with all that nonsense until later. Probably a deranged Doctor Who fan. Oh, and The Doctor got some math wrong. He mentioned that it would take two minutes for radio signals to travel from Mars to Earth. That's wrong. At their closest approach possible, it would take over three minutes. At their greatest possible distance, it would take a little over 22 minutes. So, The Doctor had even more time than he said to defeat Sutekh. The Android Invasion (4 episodes) featured UNIT, but as I mentioned earlier, the Brigadier didn't appear. Harry appeared, as did Benton, as well as their android duplicates. Benton's fate is left unclear at the end. At least, I wasn't sure what his fate was. Benton wouldn't be in the later serial involving UNIT. We met yet another renegade Time Lord in The Brain of Morbius (4 episodes). There seem to be a lot of them. Morbius was a Time Lord that was sentenced to death a zillion years ago. Though the sentence was carried out and his atoms scattered across the universe, he survived because his brain was stolen and it wound up in a bowl in some lab. Kinda like Jan In A Pan from MST3K. His brain was eventually put in a fish bowl on top of a hairy critter. Kinda like Ro-Man from Robot Monster. Morbius and The Doctor eventually had a battle on something that looked like a game console. The battle involved images of their various incarnations. We saw the faces of The Doctor (Tom Baker), The Doctor (Jon Pertwee), The Doctor (Patrick Troughton), and The Doctor (William Hartnell), plus other faces that could have been The Doctor, or Morbius. That wasn't really clear. 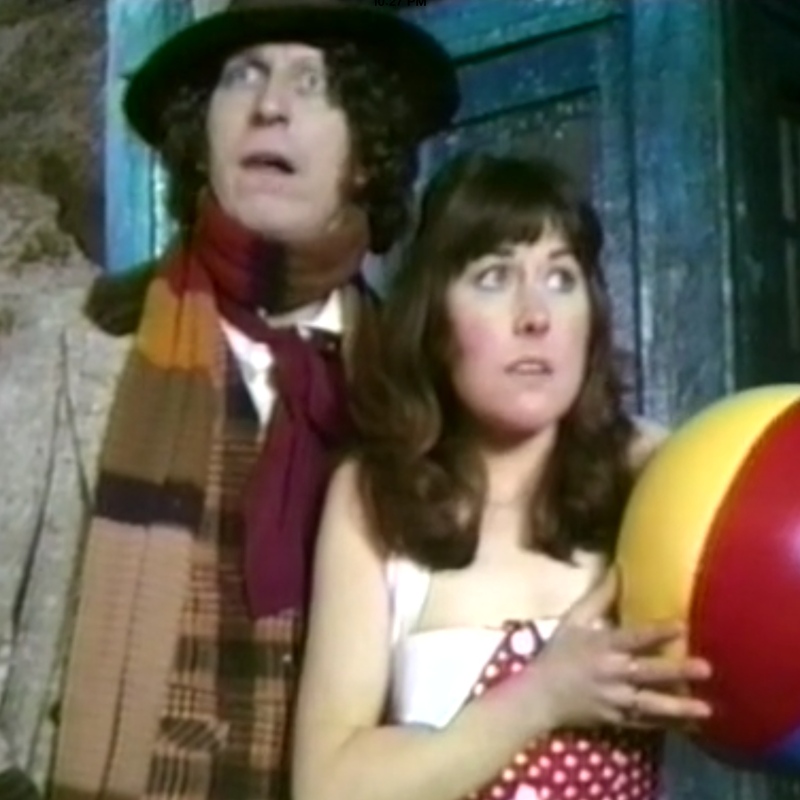 Anyway, The Doctor won and the fish bowl sparked and smoked and Morbius fell over, ran away, and then fell off a cliff. The Doctor died, but was revived without regenerating by some elixir of life that came from a flame that The Doctor had fixed by dropping a firecracker down the chimney. Or something. The season ended with The Seeds of Doom (6 episodes), which was sorta like The Thing, in that an intelligent plant life from another world was found in the Antarctic and was going to get loose and take over the world. It wasn't exactly like The Thing (any version) or Who Goes There? (the story on which The Thing was based), but there were those elements. The serial also marked the last of the stories to involve UNIT for some time. None of the UNIT regulars appeared. And, while I was anxious for The Doctor (Jon Pertwee) to get back into time and space in the TARDIS, now that The Doctor (Tom Baker) has done just that, I am gonna miss the Brigadier, Captain Yates, and Sergeant/Mister Benton. At least, we still have Sarah Jane. For now. Speaking of whom, on to the 14th season, her last as a regular. I've always loved the riddle the Doctor has to solve in Pyramids of Mars to save Sarah Jane.